In 1995, the town of Agoura Hills, California, which beneath its seemingly idyllic surface lay a reality of broken homes and drug-addicted teenagers, was rocked by tragedy. The affluent suburb, some fifty miles north of Los Angeles, was the setting of a backyard brawl that ended up in the death of a well-liked local teen by the name of Jimmy Farris. 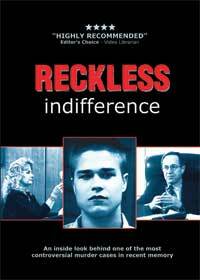 The documentary Reckless Indifference delves into the incident, which occurred at the home of a known drug dealer and ultimately sent four teenage boys to prison for life on the charge of first degree murder. The film documents the trial, presents interviews with police, attorneys, and the parents of the boys, as well as the testimony of Brandon Hein, who was one of the defendants. Much of the evidence that convicted the foursome rested squarely on the wavering testimony of Mike McCloren, the aforementioned drug dealer on whose property the scene unfolded. Inside a dark, makeshift fort on the property, McCloren and Farris were both stabbed during the scuffle, with the latter succumbing to his injuries. Due to McCloren’s accusation that the defendants were there to rob him of his expensive electronics, marijuana, or both, California’s Felony Murder Rule, which enables law enforcement to charge with first degree murder anyone present during the commission of a felony that leads to a death, took effect. Hein, whose story was thoroughly presented and examined by the documentary, was the subject of a draconian sentence passed down by an overzealous judicial system that harbored the sole purpose of making an example of him and the others in this highly-publicized case. The undeniable proof of the prosecution’s misguided zeal lied in the ridiculous lengths to which it went to put the defendants away for life, to effectively provide a deterrent to any youths considering getting into a life of drugs and crime. The prosecutors attempted to take the gang affiliation route, although they had no evidence that any of the teens involved were gang members, and did so after being instructed by the judge to drop that line of inquiry. The same attorneys also tried to establish that the defendants were “not nice” by presenting their theft of a woman’s wallet from her open car earlier on the day in question. Because the incident happened in total darkness inside of the fort, the court looked to the testimony of McCloren, which changed several times during his questioning. One of the defendants, Jason Holland, admitted to brandishing a knife to protect his younger brother Micah, but due to the setting and McCloren’s apparent perjury, it was never made clear who actually did the stabbing. Tony Milliotti, who only stood in the doorway of the fort as the fight and stabbing took place, will likely never see the outside of a prison, simply because he was there. The case was further complicated by the fact that Farris was the son of a retired Los Angeles police officer, whose supposed involvement with the trial created a political frenzy. The District Attorney’s office had just lost or nearly lost a string of high-profile cases, including O.J. Simpson’s murder trial, Michael Jackson’s child molestation charges, and the Erik Menendez murder, so it was crucial that it put a checkmark in the win column. While there is likely nothing that rivals the pain associated with losing a child, the fact that Farris’ father was allowed to use his clout as a former police officer to be present for the interrogations of the defendants undoubtedly caused three of the four boys to be unfairly railroaded. The Chief of Police for Los Angeles, with no jurisdiction in the case, and with no stake other than the satisfaction of Farris’ father, sent a letter to the judge asking for the defendants to be prosecuted to the fullest extent of the law. While all of the defendants should have been punished in some manner for Farris’ death, each sentence should have been proportionate to the level of each person’s involvement. The face that neither Hein nor Milliotti were proven to have even been involved in the fight, nevermind the murder, but are nonetheless living out the rest of their lives in prison cells is a flagrant miscarriage of justice. Today, the United States has the dubious honor of having the highest incarceration rate in the world, and that is fair proof of the unhinged prosecutorial aggression that is characteristic of the country’s judicial system, from top to bottom. When such a system sets out only to prove a point, it loses sight of fairness, of proportional sentencing, of leniency, and of the purpose of rehabilitation. Without a doubt, all of the defendants admitted to drinking, getting high, and stealing a woman’s wallet and then threatening her when she confronted them, but none of that makes them killers. Only one person admitted to having a knife on that fateful night, yet three more, none of whom committed murder, or actually had any intention thereof, had their lives robbed from them. Such is the outcome when a perfect storm of grief, desperation, and high levels of publicity batter the justice system to its core.